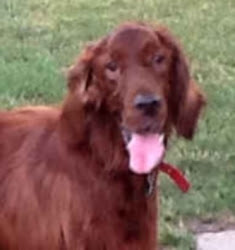 Beautiful Shawnee is a seven year old Irish Setter currently in foster care. He's neutered, up to date with routine shots, and house trained. Shawnee is overweight and on special food right now, but otherwise a healthy boy looking for a forever home. He'd really prefer a home without any cats. If you'd like to adopt Shawnee please visit www.saveoursetters.org and complete the on-line adoption application. Transportation can be arranged to just about any place in the United States. Save Our Setters, Inc. (S.O.S. ), a non-profit organization, is a network of volunteers located across the country dedicated to rescuing and re-homing displaced Irish, Irish Red & White, and Gordon Setters. Their foster families take these dogs into their homes, evaluate them, and get them ready for adoption. They provide a written profile of the dog to share the benefit of our knowledge of the dog with the adopting family, including commands, good and bad characteristics, and other pertinent information. Visit their website for a complete listing of all the available adoptable pups. Gorgeous dog. You just don't see that many setters out there for adoption. Glad there is a group for them. Shawnee is VERY handsome and we hope he finds a family of his own soon! We are sending you our paws and prayers that you get to be in that forever home you've always dreamed of. Oh my! Shawnee is just beautiful!! I sure hope he gets adopted to a loving forever home! Keeping paws and fingers crossed that he finds a furever home! Shawnee is lovely I'm sure he will find his forever home soon.